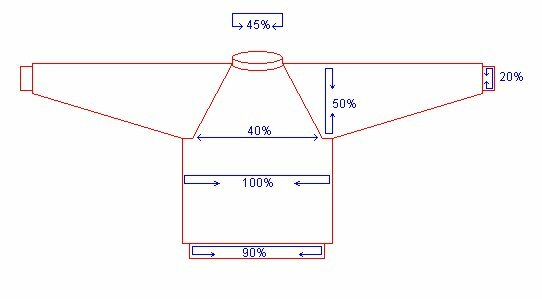 The percentage method of creating a sweater pattern uses the chest measurement plus an allowance for ease of fit as a basis for all other measurements. The chest measurement is treated as the 100%; all other measurements are some portion of that measurement. You may prefer (or need) the body or arms of the sweater to be longer than that which is calculated by this method. It is acceptable to work a few extra rows into the body or the arm length. This is a pattern for working the body of the sweater as one piece starting from the top. The sleeves are worked from the top down starting with stitches picked up from around the armhole. Double-point needles or circular needles in the sizes appropriate to the gauge you enter are needed. You will also need to have stitch holders and markers. The shaping of the sweater is based on raglan styling from the top down. Increases are made around four fixed points. At the underarm, a few stitches are cast on to give ease to the shape of the torso. I love your site, especially the raglan seamless sweater calculator. I've made one sweater so far, and have nearly finished the planning stage of my second. Both sweaters are for my kiddos. One in about a 3-4T and the second will be about a 6-7 - somewhere in that range. My reason for contacting you is just to let you know that the percentages for the sweater neck do not work on children with large heads! lol My 6 year old has a chest measurement of 23 (rounding up) and a head measurement of 21! (how scary is that?) So when I pop in the measurements there is NO WAY that thing fits over his head if I do it exactly the way the pattern spits out. So I guess the percentages are a bit different on little ones. Anyway, I can deal with it pretty easily, but it does make it a little more tricky for us newbies. Since I'm not acquainted with the formula you use yet, I'm not sure if the calculator can accommodate another increment or two for fine tuning. (Not that I expect special treatment for my giant head children) Maybe a note on the calculator mentioning that it's not designed for kids? I figured it out decently enough for my daughter, so I'll do ok with this one, as well - maybe using some of the increments from the other sweater calculator that goes in sizes for kids and adults. Important: Make a test square in the pattern stitch in which most of your sweater will be done. The test square should be made by casting on about 25 stitches and working about 25 rows. Ideally the test square should be 5 x 5 inches. This size allows you to get a good measurement of the gauge without the interference of the selvage. Knowing your gauge is critical to the proper fit of any sweater pattern.